On December 16, 1797, the South Carolina General Assembly passed an Act to incorporate a college in the overarching Pinckney District. The trustees were authorized to build and manage Alexandria College, which was built in the district seat of Pinckneyville, which was also within Union County at that point in time. On December 21, 1799, the South Carolina General Assembly passed an Act, which included provisions for escheated property within Union County to be given to Alexandria College in Pinckneyville. At that point in time, Union County was within the overarching Pinckney District. On December 21, 1811, the South Carolina General Assembly passed an Act, which included the incorporation of the Union Library Society of Union District. On December 24, 1879, the South Carolina General Assembly passed an Act, which included the establishment of a new special school district in the town of Union in Union County, and authorized the voters to decide upon an additional special school tax up to one and one-half (1-1/2) mills on real and personal property. On December 24, 1883, the South Carolina General Assembly passed an Act to establish a special school district in the town of Union in Union County, and authorized voters to decide upon an additional special school tax not to exceed two (2) mills on real and personal property. This Act repeals the above Act of 12/24/1879. On December 22, 1888, the South Carolina General Assembly passed an Act to amend the Act of 12/24/1883, by appointing six (6) members of the Unionville Academy as trustees, and increasing the special school tax not to exceed three (3) mills on real and personal property. On December 24, 1889, the South Carolina General Assembly passed an Act to authorize the Town Council of Union to issue bonds up to $7,000 for the purpose of building, furnishing and equipping a public school building, to be located in said town. On December 24, 1892, the South Carolina General Assembly passed an Act to establish a new special school district in the town of Union in Union County, to be known as the Union School District, named six (6) trustees - all previously trustees of the Unionville Male and Female Academies, and authorized voters to decide upon an additional special school tax not to exceed three (3) mills on real and personal property. The Brick Male Academy assets may be sold to raise funds for this district. On February 21, 1898, the South Carolina General Assembly passed an Act to require the County Treasurers of Spartanburg, Union, and York Counties to transfer certain appropriate public school funds to the recently-created Cherokee County. Sims High School stood here from 1927 until the early 1970s and was the first black high school in Union County. It was named for its founder, Rev. A. A. Sims (1872-1965), who was its first principal 1927-1951. It included grades 6-11 until 1949 and grades 6-12 afterwards, and educated blacks from Union and surrounding counties. In 1956 it moved to a new building on Sims Drive. The high school closed in 1970, but that building now houses the present Sims Jr. High. Sims High School, located here from 1956 to 1970, replaced a 1927 school on Union Boulevard, which in 1929 had become the first state-accredited high school for African-American students in the upstate. It was named for Rev. 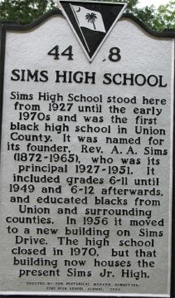 A.A. Sims, founder and first principal 1927-1951. James F. Moorer, principal 1951-1969, also coached the football team to 93 consecutive conference wins 1946-1954. C.A. Powell, who was white, was the schools last principal, 1969-1970. A new school was built here in 1956. Notable alumni include the first black head coach in NCAA Division I-A football, the first coach of a black college basketball team in the National Invitational Tournament, and the first black Chief of Chaplains of the United States Army. Sims High School closed in 1970 with the desegregation of Union County schools. This building housed Sims Junior High School 1970-2009. Sims Middle School opened on Whitmire Highway in 2009.